Very quickly, before I put up a lengthy, yawn-inducing posting on Berlin, here's a quick run-through of three geniuses of cinema I met in Tehran. First off, Abbas Kiarostami. Winner of the 1997 Palme d'Or in Cannes for "The Taste of Cherry", Abbas had just stepped out of the Fajr Festival award ceremony, walking briskly to avoid paparazzi, when I accosted him to ask for a photo snapshot. 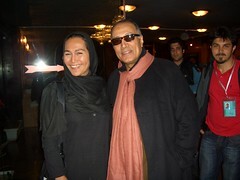 "Mr Kiarostami, I'm Yasmin Ahmad from Malaysia, a member of the jury for the Asian Cinema section. Would you take a photograph with me, please?" Below is a photo of me with Majid Majidee, the director of "Children of Heaven", "The Colours of Paradise", and "Baran". We had just finished watching "The Night Bus", one of the Iranian entries in the section I was judging. Finally, Bahman Ghobadi. Winner of two Cannes awards for "A Time For Drunken Horses" and "Marooned in Iraq". On my last night in Tehran, Bahman took me to a party, where he held my hands, kissed them gently, and suggested that I quit my job to follow him to his next shoot in Kurdistan. I was charmed beyond redeeming. Four hours later, I was on a Lufthansa flight to Berlin. A journey which was to change my life.